Long Beach CA – Spring is in the air and the flowers are everywhere, inside and out. The Beacon Art Space of Long Beach will be hosting the works of ten featured artists from the area for the Breath of Spring Exhibit. “The Breath of Spring exhibit features artists whose photos exemplify our philosophy of Conscious Living and the new air that is given to life every spring” – Says featured artist and host Lisa Brugger. With the grand opening gala March 18th, and running through May 28th, the Breath of Spring Art Exhibit showcases photography and paintings reflecting the beauty and mindfulness that only the spring can bring us. 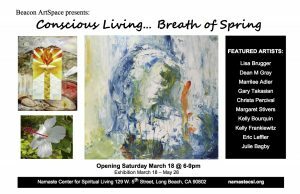 With many of the artists in attendance on the opening night and throughout the show, the Conscious Living – Breath of Spring art exhibit offers a great opportunity to see some wonderful local artists while also offering the ability to interact and mingle with them. Los Angeles artist and movie maker Keith Hildebrandt says “Art will save America”. At least in Long Beach, Art is adding a little more breath to Spring. For updated exhibit hours or to RSVP for the opening Gala, please check the website namastecsl.org. The exhibit is being hosted in the Beacon Art Space at the Namaste Center for Spiritual Living in Long Beach, located at 129 W. 5th Street. Next Topic: BlueTooth Speakers, Are They Really The Answer?